Gautier Cognac is amongst the oldest cognac houses, with a very unique location. Gautier is based in Aigre on the Osme river, and ages in an 18th century water mill. Aigre is also referred to as the “Little Venice” of Charente. The proximity to the water and the resulting humidity and temperature in the cellars gives the cognac a recognizable taste. This cognac house unites ancient history with a modern view on the cognac market. It caters both professional cognac connoisseurs and aficionados as well as younger consumers that like to experiment with cognac and try out new and trendy cocktails. 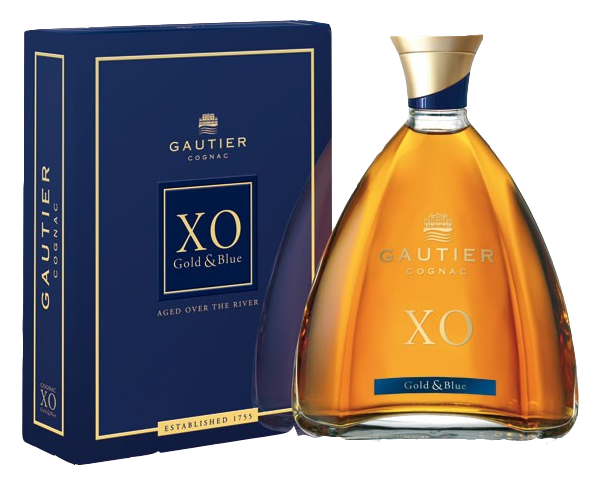 This XO is aged up to 35 years creating a finer, rounder and fuller cognac. A contemporary, elegant bottle of clear glass to highlight the authencity of the product, giving full expression to its rich and natural gold color. Subtle, harmonious, round. A beautiful gold color, floral aromas and scents of toasted bread with a hint of cinnamon. Nose suggests good maturity with prune, raisin and dried apricot. Full, well rounded mouth with full array of fruits following the nose with pear and peach. Smooth flow across the palate gives some light pepperiness and more dried fruits. Fine oak support. Slight dryness in the light, fruity finish.